Updated classic stacking toy with a twist. 4 vibrant wooden rings, teddy bear ball topper, and base. 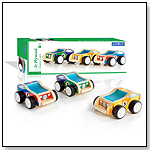 Facilitates hand-eye coordination, learning colors and size relationships. Appealing feel and look that keeps children coming back. Red ball topper screws neatly onto the top of the stack. Made of PlanWood - sustainable material from leftover sawdust.